A comics author who lectures at Wrexham Glyndŵr University has published his latest work – a dark comedy – in collaboration with a micro-fiction novelist. 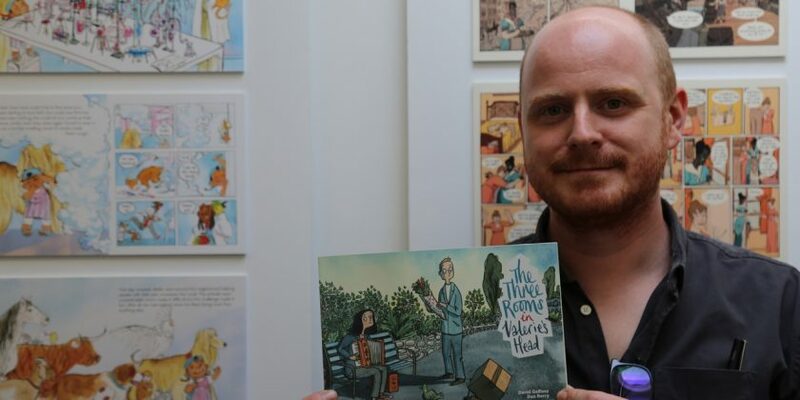 Dan Berry, who lectures on the University’s BA (Hons) and MDes Illustration, Graphic Novels and Children’s Publishing course, brought out ‘The Three Rooms in Valerie’s Head’ with micro-fiction novelist David Gaffney earlier this year. The dark comedy looks at the interior life of Valerie, who is unlucky in love and who mentally drags her exes out of the cellar to examine what went wrong. It originally began as a performance commission for a comics festival in the Lake District. “I got together with David thanks to the Lakes Comics Art festival,” explained Dan. “Julie Tate, the director, was a fan of both of our work and commissioned us to do a performance piece based on David’s short stories books, Sawn Off Tales and More Sawn Off Tales. “We worked for a year together on the piece to plan and draw it. We performed it alongside recording artist Sarah Lowes. Essentially, it was a live performance of a graphic novel – with my art, David reading his words and Sarah playing a live score. Dan, who has been nominated for several industry awards, has published a range of graphic novels and often makes appearances at comics events. One former collaboration which, like his current book, originated at the Lakes Comics Art Festival, led to Dan securing an Eisner award nomination – the comics equivalent of an Oscar nomination. The nomination was a major achievement for an artist who had – quite literally –started out small, drawing Post-it note sized comics and hiding them in other people’s work in bookshops. He said: “I began reading comics as a kid with Asterix and Tintin – I was never really one for comic book superheroes. “I fell out of love with the medium in my teens, and came back to comics in my early 20s, when there was this new thing called the graphic novel to explore – people like Jeffrey Brown, Chris Ware and Marjane Satrapi. “I started drawing very small comics and would hide them in books I liked in shops – essentially hoping that people who found them, who perhaps thought a similar way to me, would appreciate my work. “From there, I started doing bigger comics and working with other people, and published some autobiographical comics and also some 24-hour comics – where a 24-page comic is literally made in 24 hours. Dan, who studied at Glyndŵr more than a decade ago before coming back to the University to teach the Illustration, Graphic Novels and Children’s Publishing course, now combines his teaching with his work. He has worked for clients such as the Arts Council, children’s author Michael Rosen and the NME, and the course he teaches is one of a handful worldwide that specialises in creative writing, storytelling and narrative imagery for graphic novels and children’s publishing. As part of the course, students are encouraged to get their work out into the wider world and to get noticed. Dan added: “We help students to develop their work and get it out there, to self-publish and pitch to the industry. “We have had many successes and students have won a range of awards. The same year that I was nominated for an Eisner, one of our students was too, for work she had done a comic called Giant Days. You can find out more about the BA (Hons) and MDes Illustration, Graphic Novels and Children’s Publishing course here. Read 1,258,661 times in last 30 days. Read 1,258,661 times in last 30 days, and 73,812,840 times since we started in 2011.